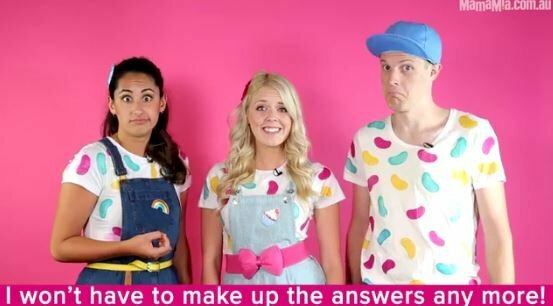 Mamamia has launched a “family-friendly” kids podcast, The Beanies, which it says will save parents embarrassment and hassle when they are bombarded with questions from their kids, and will also serve to distract children from staring at screens. Promising to answer questions such as “What is rain?”, “How do fish breathe?”, and “What is space?”, there are 10 Beanies podcast episodes ready to go “which should buy [parents] a little bit of peace and quiet”, the media company said. “Each episode is packed with educational stories, games, and songs that you’ll love to listen to… over, and over, and over again,” Mamamia’s announcement said. The episodes, which were released this week, range between 12 and 18 minutes long, with Mamamia also claiming the top four kids and family podcasts yesterday including: I Don’t Know How She Does It, Hello Bump, The Beanies and This Glorious Mess. Head of entertainment at Mamamia and co-host of the This Glorious Mess podcast Holly Wainwright said the network’s audio offering continues to resonate with busy parents and different life stages. “The addition of The Beanies brings something new by providing something that little kids and mums can listen to together. We’re always careful in our parenting content to make it as much about the parents as the kids, and The Beanies is fun for both,” she said. Commercial director Claire Harrison said Mamamia’s growing podcast network offers brands numerous opportunities to “connect with Australian mums and be part of the conversation they are having”. “Two of the five parenting podcasts produced by the Mamamia Podcast Network are bespoke branded solutions and represent the innovation Mamamia is driving to connect brands with Australian mums in this space,” she said. The latest podcast push comes after Mia Freedman told Mumbrella last year she wanted the company to “own” the attention of women, something it would increasingly achieve via audio options. “Women have jumped onto podcasts very quickly. I would say that podcasts are growing faster among women than any other demographic regardless of generation,” she said. “There’s a limit to the number of hours in the day you can look at a screen and there is still that desire to absorb more content and have more conversations. Mamamia’s managing director Kylie Rogers said last year podcasts were a premium offering for brands looking to connect with Mamamia’s audience. Oh yes, let’s indoctrinate kids with faddish, inner city “values” to undermine their parents authority and family values. This is a transparent case of infiltration of innocents with Mamamia green-Left world view, and it will be exposed for what it is at every opportunity. Mike that’s a joke yes? “Infiltration of the Innocents” – must be a joke, or a bizarre chip on the shoulder – rofl. Mike if this isn’t a joke you should really listen to the content before behaving like a complete prawn. Jeremy, I think Mike has a very balance viewpoint, brought about by the equally large chips on both shoulders.